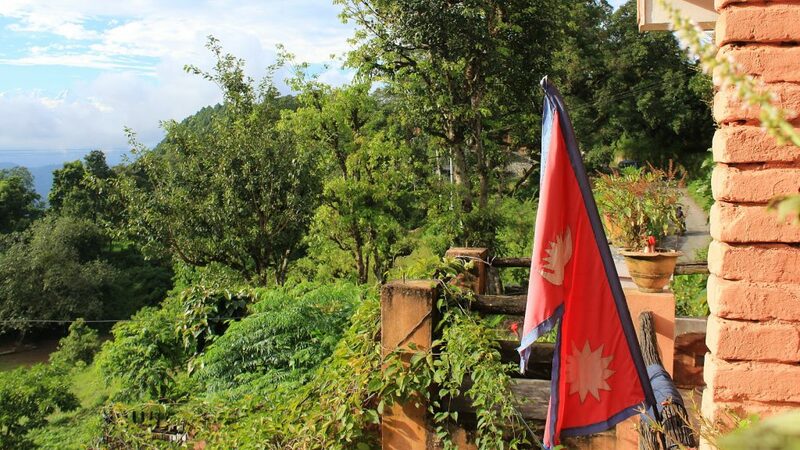 Nepali or “Gorkhali” is the official language of Nepal. Nepal is the home of numerous smaller languages, but Nepali is the lingua franca that is understood by practically all locals. 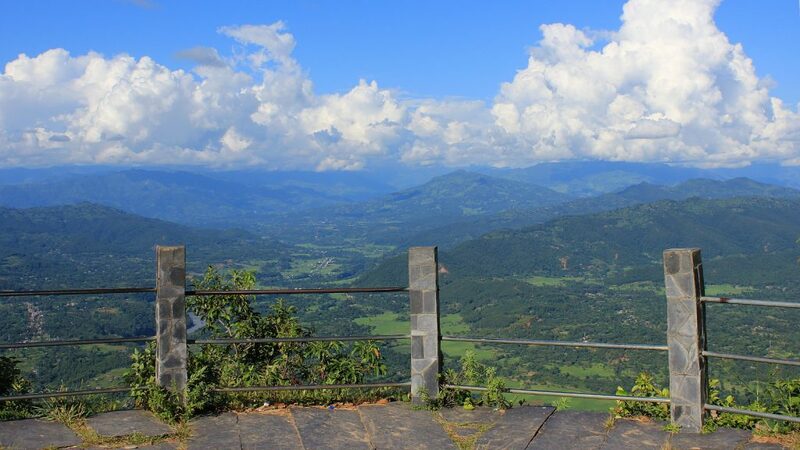 I’ve recently had 45 hours of private lessons of Nepali language in Pokhara, Nepal. I still don’t speak Nepali at a conversational level, but the intense lessons went through all the most important aspects of Nepali grammar. While I’m not an expert of the language, I believe I’m experienced enough to comment the difficulty of learning Nepali language. The easiness of studying a language depends on the background of the student. My own first language is Finnish, and I also speak English fluently. Besides those two languages, I also know some Swedish, Spanish, Russian and German. I’ve also studied Japanese and Latin for a few months, but now I only remember the very basics of them. This post is not aimed at native speakers of any language in particular. However, you can keep in mind that I’m most familiar with Germanic, Italic and Finno-Ugric languages. I try to make a lot of comparisons, so you can understand how Nepali compares with other languages. 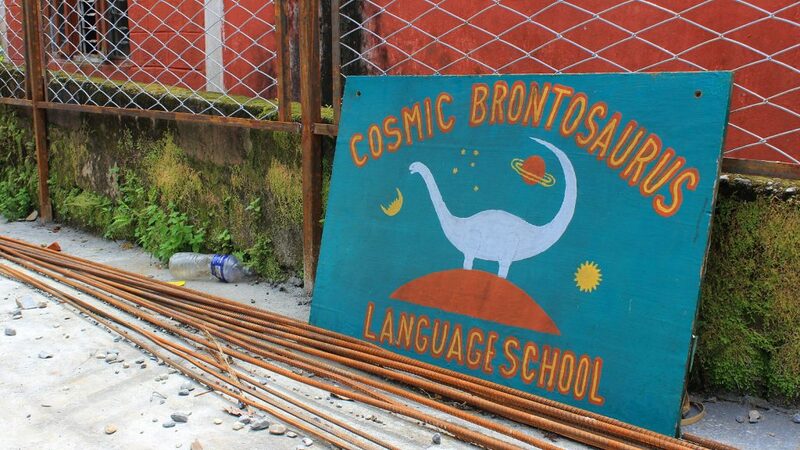 I studied Nepali language at Cosmic Brontosaurus Language School in Pokhara. The first Nepali language word you learn is most likely namaste. Namaste, which comes from Sanskrit and is also used in India, is used as an universal greeting in Nepal. You can also use an even more polite version namaskar occasionally. You don’t need to learn different greetings for different times of the day, as namaste is always used. Besides namaste, you get surprisingly few chances to impress locals with basic Nepali phrases in daily transactions. While you can say thank you (dhannyabaad) and you’re welcome (swagatom), Nepali people don’t really use these phrases in shops and restaurants, so using them too much might seem odd to locals. Still, learning a few basic phrases like “how are you?” (tapaai-laai kasto chha?) and what is your name (tapaai-ko naam k ho?) can make the locals smile. Nepali language is related to Hindi and the ancient language of Sanskrit. Unsurprisingly, these languages share a lot of vocabulary with each other. If you know Hindi, you can do fine in Nepal, as the languages are mostly mutually intelligible. Nepali people are used to watching Hindi tv-shows and movies, and many Nepali people understand Hindi. If you don’t speak Hindi, it will not be easy to learn Nepali language vocabulary. Most words are completely different to the ones used in European languages. Luckily, common Nepalese words tend to be quite short and not extremely complicated. I like the logic of word forming in Nepali language: for example, the word for children is keta-keti (“boy-girl”), these days aaja-voli (“today-tomorrow”) and a few dui-char (“two-four”). Simple, isn’t it? Nepali is an Indo-European language and thus a very, very distant cousin of English and many other European languages. There are some basic words that may sound similar: dui is two, aath is eight and dath is a tooth. Nepali language also uses a lot of loanwords without any modifications, so you here words like uncle, car and chocolate bar appearing in the middle of sentences. The pronunciation of Nepali language is mostly not difficult. As in Spanish, Swedish, German (and almost all other languages that I know except English), the written symbols correspond with specific spoken sounds with very few exceptions. In other words, the letters are usually pronounced the same way, so an i is an i no matter what sounds surround it. Most Nepali sounds are also fairly easy to pronounce. A big difference to Western languages is that most of the consonants have two versions, the unaspirated and aspirated sound, but these are quite easy to distinct. In aspirated sound, you release a puff of air with the consonant, so a paa turns into phaa and kee into khee. 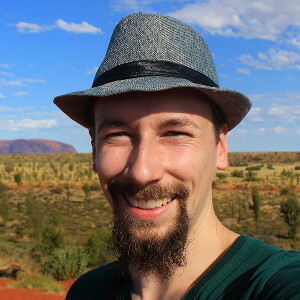 The biggest challenges I face with the Nepali language pronunciation are the sounds that are completely missing from my native Finnish language. I can usually handle the added nasal sounds, but Nepali has two different sets of t and d sounds that I just can’t differentiate. One group (dental consonants) are pronounced with tongue close to your front teeth, but for the other set (retroflex consonants), you have to curl your tongue at the top of your mouth. Most of the time, I just cannot hear the difference, although I bet it is very clear for locals. I guess it’s like Japanese people and the distinction between l and r: their brains have not learned to hear the difference, so both consonants sound the same to many of them. The phrase “same-same but different” doesn’t apply to Nepali grammar. It is just different. Ma patrakaar bhayera dui barsha summa kaam gar-ey. The sentence means “I worked as a journalist for two years”, but if you translate it literally without changing the word order, you get “I journalist two years until work did”. As the example above shows, the structure of Nepali sentences are a bit different from many other languages. Instead of the European S-P-O (subjective, predicative, object) word order where the verb usually follows the subject, Nepali language puts the predicative at the end of the sentence (S-O-P). There are also some other differences in the word order, which take a while to learn. 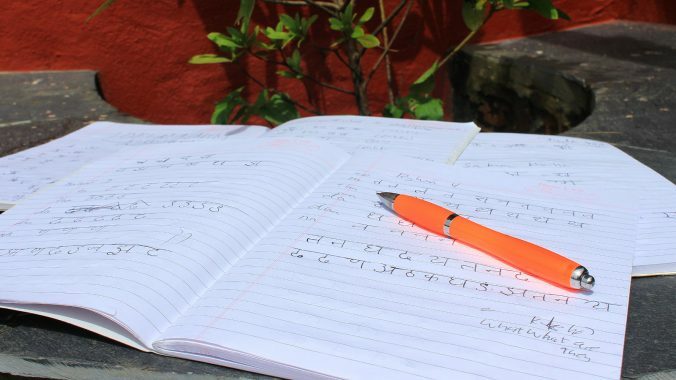 Nepali grammar is not too complicated – it’s just very different from most European languages. The prepositions are replaced with suffixes at the end of the word, so “in Nepal” is Nepal-maa and “from America” is America-baata. It is similar to the grammatical cases of Finnish and Hungarian, except that the root of the word doesn’t change, so you don’t need to learn infinite amount of new conjugations for every word. The Nepali verb conjugation depends on the pronoun, so instead of saying “I run, you run, they run”, the verb is conjugated differently in each of these cases. Not only that, but the verbs come with different conjugations for negative forms, too. There are also three different levels of politeness for some pronouns with different conjugations. Even male and female subjects in third person require different conjugations! Yes, the verb conjugation of Nepali is complicated – it still isn’t as hard Finnish or even Spanish, but learning it is definitely hard. At the same time, you don’t need to learn all of it to start speaking Nepali. I have not learned the most unpolite versions of you and him/her, because there are very few cases where I’d really need them. Fortunately, there are ways to “cheat” with the conjugations. These remedies are quite similar to the simple forms of Spanish. In Spanish, you can replace the different past tenses with a much easier present perfect (he hablado, has hablado). Likewise, the future tense can be replaced with a simpler “going to” structure (voy a caminar, vas a caminar…). In the case of Nepali language, the similar easements are called simple past and simple present/future. In these tenses, you can replace all the different conjugations with one ending for all pronouns. So, instead of saying ma sutey and tapaai sutnu-vayo (“I slept” and “you slept”), you can use the conjugation sutyeko (“finished sleeping”) for both. For the future and present case, sutney does the same trick. 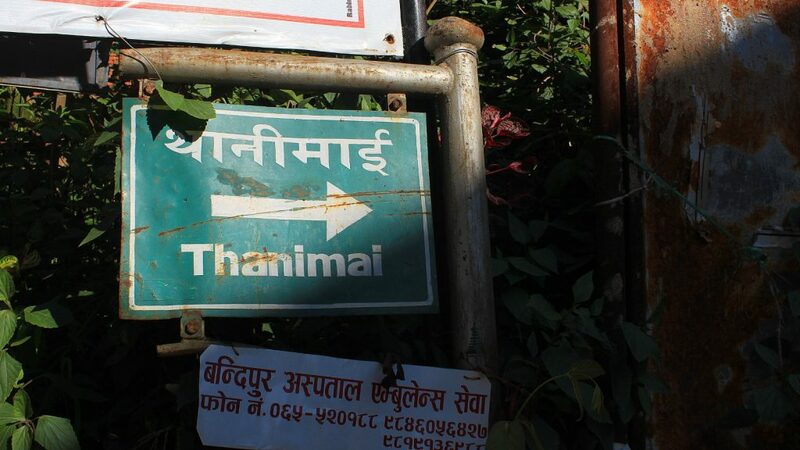 A sign in Bandipur written in both Devanagari and Roman alphabet. The Devanagari script is used in Nepali and related languages with only minor variation. The very basics are similar to Latin and Cyrillic alphabet: the script is read from left to right and the words are formed from syllables, consonants and vowels. The most visible specialty of the script is the horizontal line that runs above the words. In my experience, I’d say that learning the Devanagari script is a little bit more difficult than learning the hiragana or katakana writing systems of Japanese. In all these systems, there are no distinct capital letters, which makes the learning a bit easier. The logic of the alphabet in Japanese and Nepali are a bit different. In hiragana and katakana, you learn set groups of syllables: ka, ke, ki, ko, ku. In Devanagari, the consonants form different groups of five: ka, kha, ga, gha, nga. Syllables like ke and ghu are formed by adding vowel symbols to modify the consonants, thus forming new syllables. Once you learn the vowels, the basics of Devanagari are not impossible to read and write. The biggest limitation of the Japanese script? You cannot write consonants without vowels, so a foreign name like “James” has to be written as “Jamesu”. Devanagari script tackles this and many other limitations with special characters such as half consonants. The half consonants, which are slightly modified versions of the full consonants, can be used without a vowel to put to consonants together. With half consonants, you can write things like kka and ska. The half consonants and other special symbols make the writing and reading of Devanagari more challenging. Instead of just knowing the basics, you also have to remember a bunch of exceptions for writing different letter combinations. You just need to know that the u symbol in ru is not put in the same place as with every other consonant. In addition, some consonant combinations have special symbols for them. The remnants of the Sanskrit language also add obstacles for newcomers. There are some rare characters that mostly appear in old Sanskrit based words. It’s very difficult to know which symbol to use when you write a word for the first time. Now, I return to the question in the topic: is it hard to learn Nepali language? The short answer would be yes – the language is very different from most European languages, so there’s a lot to learn. Whether it’s the grammar, the vocabulary or the writing, there’s no area where you could survive without hard work. Learning Nepali language basics is made even more laborious by the lack of good learning material. Dictionaries for different languages are rare, there aren’t many online exercises available and Nepali is not in Duolingo. The writing of Nepali with Roman alphabet is not very standardized, which is also a big issue. You just have to learn the logic of your teacher to pronounce the words correctly, and another person will write the same words in a completely different way. At the same time, learning Nepali is by no means impossible. The language is not extremely complicated, just extremely different. While a month of intense studying is only enough to get you started, an elementary conversational level could probably be reached within a few months.